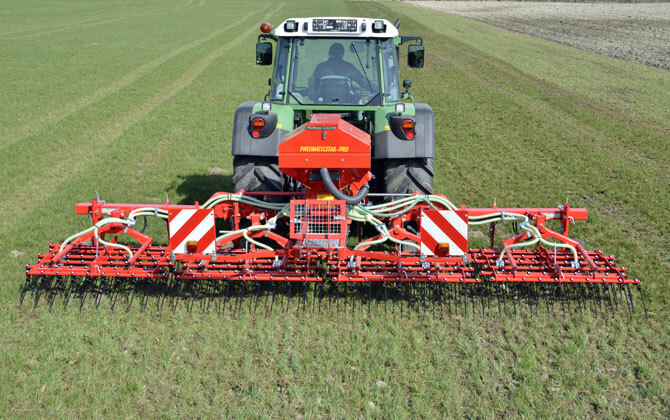 For maintenance, reseeding or distribution of undersown crops, the Pneumaticstar-PRO is the ideal machine. The Pneumaticstar-PRO is the further development of the popular and tested Pneumaticstar. 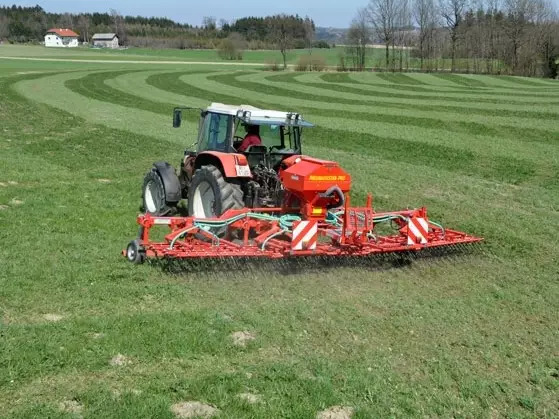 This machine has been specially designed for contractors, communities, big companies and for farms which have to work uneven pasture with large molehills. It can work even more aggressively, important when fighting rough stalked meadow grass or de-thatching. Many tines work and aerate the turf better and support tillering. Thinner tines, like the ones with 8 mm, enter mats better when they are adjusted on "hold". Valuable, deeper rooted grasses are not harmed. The new PNEUMATICSTAR-PRO is equipped with a heavy levelling board which flatten molehills before the support wheels pass. It is adjusted on "hold", which lifts the soil and spreads it loose in the turf. Pores in the soil are not smeared up! Adjustable springs protect the levelling plates from overload. 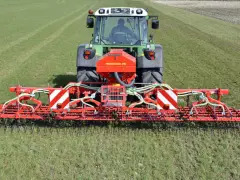 The 6-row weeder section carries 60 tines on 1.5 m working width, this gives a line distance of 2.5 cm. The tine aggressiveness can be adjusted by a central lever per section in 5 positions. The weeder sections are parallel guided and are equipped with hydraulic level control and pressure control. Therefore they follow the surface ot the turf very precisely. This ensures an even working of the soil over the full working width even in difficult conditions. Thanks to the hydraulic level-control, the machine does not rock or vibrate. Depending on usage and soil conditions the PNEUMATICSTAR-PRO can be equipped with various tines (8 or 10 mm). The seed tank has a standard capacity of 300 litres (500 litres are optional available). A stirring shaft prevents the de-mixing as well as the creation of bridges in the tank. The flexible drive shaft, connected to the rubber support wheel drives the stepless gearbox, which runs the seeding roller and the stirring shaft via a chain. 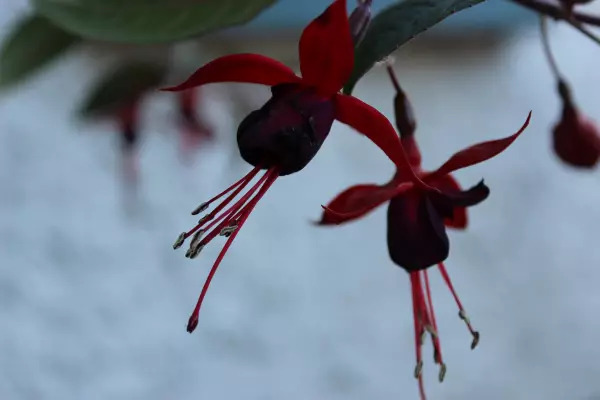 Subsequently the seeding shaft brings the seeds in the air canal, where it is, depending on the size of the machine with help of the air flow of an electrical, PTO driven or hydraulically driven fan through plastic hoses, brought to the distribution plates. The decision, which blower to be used depends on the working width and the type of seeds which to be drilled. Specially formed deflector plates guarantee an exact seed distribution even in windy conditions. With 12 m working width, the PNEUMATICSTAR-PRO 1200 presents a quantum leap in terms of productivity, efficiency and flexibility. The machine combines the known technical features of the mounted version with a solid chassis. Due to the very movable frame, the machine ideally fits the contour of the grassland, despite the large working width.